← Honorary “Singleton” Goes Global! I’ve always said, nothing but the best for my dog, Henry. As a Cavalier King Charles Spaniel, he has royalty in his blood. Which is why, when he was a mere pup, Henry went to daycare. And not a daycare for pets, mind you. Henry was enrolled at the best home childcare center for little tykes in the county, and it is run by my very good friend, Gale (who, you might remember, is the Real Ms. Fix-it). Once inside, he’d run eagerly through the kitchen, past the family room, and out the door to the backyard where he’d check out the kid action, then return inside to play with Gale’s dog, Blanca. Well, sort of. Blanca was a bit older and it was all she could do to tolerate Henry and his wild, puppy antics. Henry and Gale's grandson enjoying their pacifiers. 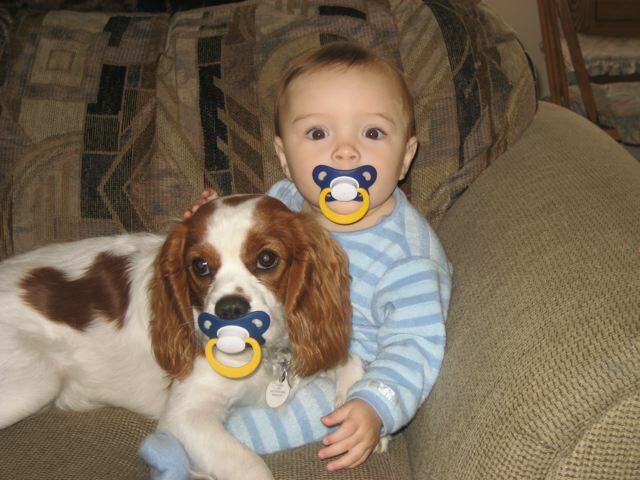 But while there, Henry developed an unusual obsession–a fascination for pacifiers. Yes, it wasn’t long before Henry discovered pacifiers and became obsessed with watching the kids use them. He’d stare intently at a child’s mouth, patiently waiting for the pacifier to drop to the floor. Maybe he’d wait five minutes. Maybe longer. He knew that inevitably, the pacifier would fall, and when it did, it was his. The big pay off! Henry developed many a strategy for swiping pacifiers from innocent babes. He’d feign interest in playing with the toddlers and run and let them chase him in the yard, all the time keeping his eyes on the prize–until he hit pay dirt. Bingo! He’d also watch them at snack time, sucking on their pacifiers, while playing with their Cheerios. As soon as a child reached for the cereal to put in their mouth, the pacifier would pop out and land on the floor. Henry was on it like a hawk swooping down on a mouse. That dog owned the ground and any pacifier that fell on it was his. I’m pretty sure that Henry’s obsession led to a shortage of pacifiers that year. I never did figure out why Henry had such a thing for pacifiers. Could be he liked it for the same reasons little ones like it–for teething or for the comfort it brings. Or maybe he just wanted one so he could feel like a kid, himself. No matter the reason, he sure did love sucking on them. It’s been a while since Henry went to daycare and pinched a pacifier or two. Now, he’s a stay-at-home dog with no more unlimited access to his obsession. Though occasionally, he does find a discarded or forgotten one when he takes a walk in the park. And every year, for his birthday, I let him be a kid again. I buy him a pacifier of his very own. I have never seen a dog do this. My dog just likes to swipe food, especially – well – just anything as long as it might have been on a plate at one point in time. Oh wow, that picture is just the cutest! I love that he swiped pacifiers! Aren’t dogs so clever?! That is hilarious! And what a cute picture. Casey never got into pacifiers (neither did Sophie for that mater). My kids were never into pacifiers either so who knew my third kid would be so into themt? But you gotta love it. I mean how often does that happen, a dog that knows how to use a pacifier? Henry is gorgeous! Dogs continue to amaze me with all their quirks and obsessions. Thanks! Yeah, dogs can be pretty cool and Henry has a personality that’s all his own. Thanks for commenting! Ha. This is so cute. What a great post and read. Henry is a beautiful dog. My cat used to have an obsession for spoons. Every time a spoon fell off the dining table, it would be in her mouth. Never would it be returned to the owner. Always with her. And then it mysteriously vanished. This was when I lived with my parents. My cat’s quite young, three years. When the time came for me to move out of the house, I wanted to take her basket with me. I lifted up, and lo and behold! Behind were the family’s missing spoons! I, however, did figure out why she had that obsession. The spoons were in a pile, and I got that feeling that she would climb up on them and sit, to make herself feel and appear tall. THAT, I never did figure out WHY she wanted to make herself tall, but, she did. Well, I would just say that pets are awesome! Wow! Now that is one clever cat! It’s fascinating to see what unique habits, interests and yes, obsessions our pets will develop. My friend, Gale, and I got quite a kick out of watching Henry go to all lengths to get a pacifier. But, spoons to feel taller? I love that! He’s a pretty clever dog, especially when he gets a bee in his bonnet about something. Heaven help the baby with a pacifier in his mouth. If Henry’s around, it won’t belong before the pacifier finds its way to this mischievous dog! I don’t much care for dogs. Unlike cats they are not independent creatures and are far too willing to cow tow to the emotions of their owners. In principle I could make an exception for a dog called Henry but it seems to me that he is not brutal enough really for a Henry. Have you thought that discipline might be improved for Henry if you made it clear to him that unless his behaviour is more docile you would change his name? I used to be a cat person and, if truth be known, Henry is my first dog. He’s a wonderful, patient and calm dog with a sweet disposition. He might not be the most disciplined as far as dogs go, but he’ll do just fine. And, let me tell you, Henry is pretty independent for a dog. Spends a lot of time on his own. Even when I’m around, he spends a lot of time hanging out by himself downstairs, while I’m writing my blog. So don’t look down on Henry just because he’s not brutal enough. He’s a fine dog and I’m glad he’s lives here.